CSA Week Five: New Potatoes! Today was an exciting harvest day on the farm. First-of-the-season harvests of carrots, beets, basil, green cabbage and new potatoes! Boil the potatoes and toss them with a little salt, pepper and butter… there’s nothing more sublime than just-dug baby potatoes. Blueberry season is on its way! Two years ago we connected our members to the berry farmers at Red House Farm in Waldoboro. Known for their incredible organic low-bush berries, it was a great disappointment last year when their harvest was limited by a late frost. But this year, berries are back! There is high demand for their berries, and I suspect that more of our members will want to purchase berries than there are available. So for this first round, members will be limited to one 10-lb box per family, and even with that every family who wants to purchase a box may not be able to do so. We hope that it will be a great berry season, though, and that at the end of August they may be able to open their schedule up again for more orders. I’m still figuring out how to take these orders online, and will email a special link for members to purchase berries as soon as I figure out the details. The price of a 10-lb box is $35. A couple of other things to put out there: our apprentice Les and his boyfriend Jaqxun are looking for an inexpensive rental starting this fall. They would love to exchange yard or garden work, or childcare, for part of their rent. If you know of such a place, please pass the details along! 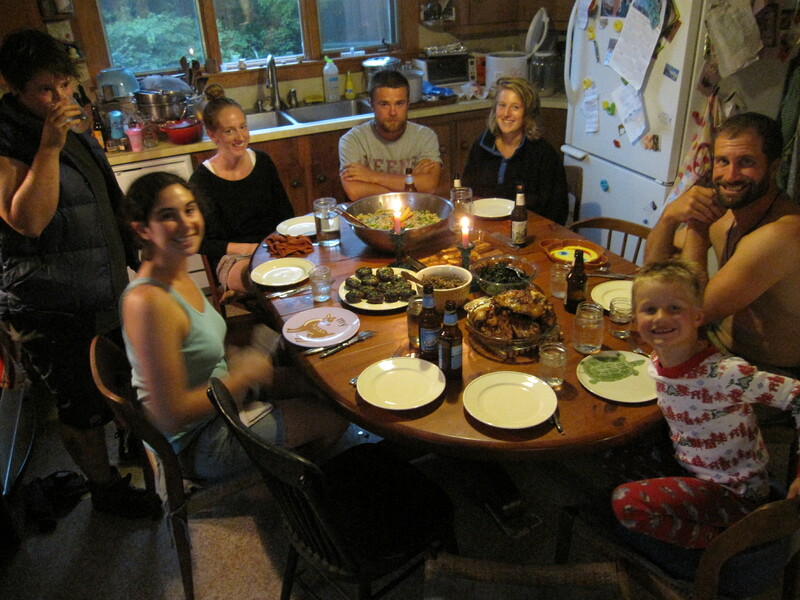 We were lucky to have a returning WWOOFer on the farm this week (WWOOF= WorldWide Opportunities on Organic Farms. Many of our short-term volunteers come to the farm through WWOOF). Corinne Beaugard first came to the farm to volunteer last summer, and is now running the greenhouse at the Children’s Museum in Portland for the summer. It was great to have her back for a few days. Have a great week, enjoy your veggies, and please let us know what is or is not working for you. We love feedback, both about the veggie share and about the add-ons, if you get a chance. Once a week we have “farm dinner” when the full crew eats together. This meal included barbeque chicken, sesame kale salad, Hen-of-the-woods mushroom salad, spinach and goat cheese-stuffed mushrooms, baked zucchini, rice and garlic scape salad, and strawberry pie from the dessert share! L to R: Les, Emily, Corinne, John, Sara, Bill & Eli. Missing from the picture: JP, Cecilia, Reba, Megan and Neil. Cecilia insists on lighting her favorite pink candles at every farm dinner. Ambience is everything.